The TRX has taken the fitness world by storm. This small, yet incredibly versatile piece of exercise equipment is creating a new craze. From cross-fit and bodybuilding to home and commercial gyms, the TRX is finding its way into every corner of the industry. The success and genius behind this product lies within the simplicity of use and design. With just two straps and two handles, the TRX is capable of much more than meets the eye. There are countless TRX exercises that can be performed. The only limit is imagination. Here is a list of exercises to help incorporate the TRX into your home workout routine. The good thing about this type of strength training is that you can use it to switch up your usual workout routine and bring a bit of diversity to your exercises. 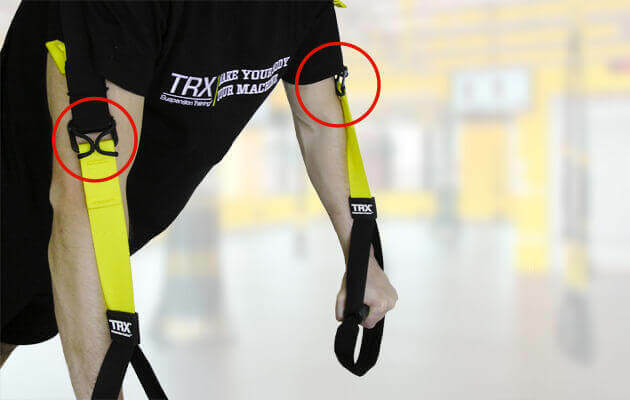 A unique feature of the TRX is that it hangs from above. For this reason, many exercises are done while in suspension. Hanging rows are performed with your back facing the ground and hands gripping the handles. Your feet are on the ground in front, providing support. With arms somewhat parallel with the TRX bands, pull your chest up towards the ceiling and then lower yourself back down. Hanging rows help to target the back and bicep muscles, while also strengthening the core. Although the TRX may seem to focus on upper body movements, there are still many leg exercises that can be performed on this piece of equipment. Lunges are a great way to target the glutes, hamstrings and quadriceps. Begin by standing with your back to the TRX. Lift one foot up and place it inside one of the handles with the top of the foot facing the ground. Take a comfortable step forward into a lunging position. From here, lower your hips towards the ground to complete the motion. Rise your hips upward before allowing your knees to hit the ground. This exercise is great for lower body mobility and strength. Lunges stretch out the hip muscles which can help to lower the chances of injury caused by tight muscles. The TRX doesn’t have to completely change your home workout. Instead, it can help to make common exercises more challenging. 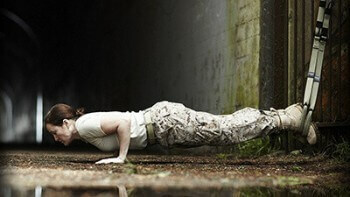 For example, pushups on the floor are much easier than pushups performed on the TRX. The form is completely the same, except your upper body is raised off of the floor. Place both hands through the handles at slightly wider than shoulder width. Your toes will be on the ground like a standard pushup. Lower your chest towards the ground until about even with forearm and then push upwards. Pushups are an excellent workout for building chest and shoulder strength. The arms are also worked in terms of stability. Because the TRX hangs from above, most exercises will require body stability. The abdominals are a key muscle for achieving this support. However, there are exercises on the TRX that target this muscle group directly. Start with your feet below the TRX in a push up position. With both hands on the ground for support, place both feet through the handles. Once in a comfortable plank position, slowly bring your knees towards your chest and then release back to the starting position. This exercise works the ab muscles while also working arm muscles for stability. Normally, chest flyes are an exercise reserved for gyms with dumbbells and proper equipment. With the TRX, however, it is possible to perform this exercise at home. Start in the standard push up position with your hands on the TRX handles and toes on the ground. Lower your body towards the ground by moving your arms outwards. It is important to keep your arms slightly bent to prevent over extension. This exercise helps to work the outer portions of the chest, while also stressing the shoulder muscles. The TRX packs a large punch for such a small piece of equipment. It can easily fit into a gym bag yet is capable of replacing almost all other pieces of gym equipment. The TRX is the perfect addition to a home workout routine. This product capitalizes on all the standard home exercises by making them slightly more difficult. With the stabilization factor, abdominal muscles will get worked even through indirect movements. These exercises are just a few examples of the dozens that can be performed using the TRX. How was the TRX Suspension Trainer created?